(Saunders 1950) Emerging very early in spring, this gigantic macrophylla hybrid with its wide spinach-like green leaves forms a spectacular plant that is gorgeous throughout the season and into fall; about 4 to 5 ft. wide by 34 inches tall; large buds open into immense single flowers of pure white with a tuft of golden staminodes in the center surrounding carpels with red stigmas at the tip. Rare. (Auten 1933) Large rose-form pastel pink double with subtle lavender pink highlights; a lovely variety to compliment your other late blooming peonies; medium height, stiff stems; intense old rose fragrance. (Klehm 1963) Creamy white bowl-shaped double flowers that an measure 9-1/2 inches across; hidden golden stamens tucked in the petals; strong stems and outstanding deep green foliage; strong stems to 32 inches in height; staking suggested. (Krekler/Roy Klehm 2002) Dahlia style blooms sport a unpredictable mix of cream, white and rose; three to four buds per stem; strong stems to 24 inches; slight fragrance; a peony with a different attitude, that's for sure. (Roy Klehm 1958) Ivory white double bomb framed by wide white guard petals; graceful and elegant form; vigorous growth with strong stems to 34 inches in height. (Anderson 1981) White double with red striping in pleasing peppermint candy combination; a tall vigorous plant that looks good and blooms well even the most difficult seasons; height 36 to 38 inches; long strong stems each topped with medium size flowers; superb cut flower. (Bigger 1952) One of the most unusual and dazzling Imperials (aka Japanese); the blooms are crisp white with a center mass of spiky white staminodes; smaller petals or petaloids may emerge from the center; an extraordinary peony but may get off to a slow start when the weather is cool, which is often in the PNW; may require a few years to bloom well. (Roy Klehm 1980) Pure white semi-double to fully double with sprinkling of white petaloids appearing out of the golden center; strong stems about 28 inches in height and a reliable bloomer; produces pollen and seeds. 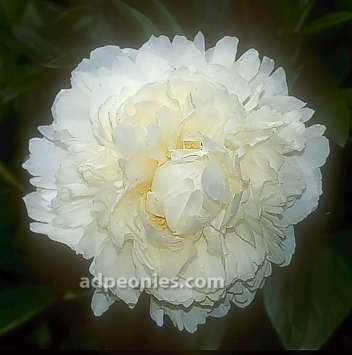 (Roy Klehm 1985) A showy Japanese peony that combines white and gold into an exciting double-like mass of fluff and frills; double row of petals surround the pom pom of golden staminodes, while contrasting white petaloids bloom out of the pom pom; 36 inches tall. (Anderson 1986) (Intersectional) Large flowers with frilly white petals and deep lavender burgundy flares; the contrast between them becomes more vivid as the bloom remains open; one of few Itohs with this stunning rockii coloration. (Calot 1973) Crown of Gold refers to the ring of yellow stamens that gives an inner glow to this large white double bloom; center petals are often tipped red; emits a strong scent of lilies; dependable and floriferous in the late season; for both cuts and garden display. (Sass 1938) One of the best of the late season; a brilliant pure white double that has a subtle golden glow within; long strong stems carry the large, full flowers well above the foliage and stand all the better with support; delicious fragrance. (Calot 1856) Creamy white blooms of medium size are produced in abundance on a medium tall plant; the flowers are cupped with white guards and a full center of light canary yellow petals deepening to pale green at the base; a flower of antiquity still much admired. (Mielles 1851) Tall, large white double that opens with vivid crimson edges on some of the petals; an old variety and still one of the most well known; requires support. (Charles Klehm 1981) White double with a ball center surrounded by guard petals; strong stems to 34 inches, each stem with 4 buds; a reliable opener; pleasing fragrance and good substance; excellent cut flower; Alice Harding X L. Gumm seeding that first bloomed in 1951. (Carl Klehm 1978) Frilly ivory white with layer after layer of fringed petals that surround a small stand of golden stamens; excellent form and substance; dark lustrous foliage; about 30 inches tall. 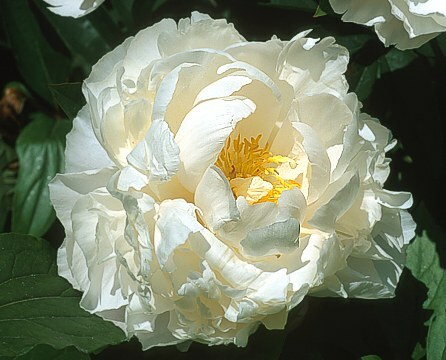 (Nicholls 1938) There are some great white peonies and this is one of them; large perfect rose form flowers, dense with petals; side buds help extend the bloom; well formed bush with a grand stature that reliably produces great flowers and exhilarating fragrance; thick stems stand well without support. (Lins 1955) Like a gardenia in appearance, this blush white double is one of the finest; many tyimes a winner of championship ribbons; a mild fragrance; many side buds extend the bloom; strong red-tinted stems to 34 inches; stout plant. (Krekler-Roy Klehm 1995) A medium-size bloom of cream and green with lime green streaking and soft pink highlights at the petal edges; 28 inches tall, dazzling, perhaps even mysterious; imagine in arrangements with Coral 'N Gold. (Brand 1928) A large single flower with broad pure white crinkled petals with the texture of white crepe paper; yellow stamens in center; strong stems. (Sass-Interstate Nurseries 1949) A large pure white double, high built, of perfect form and pristine beauty; strong stems, dark green foliage; about 32 inches tall. 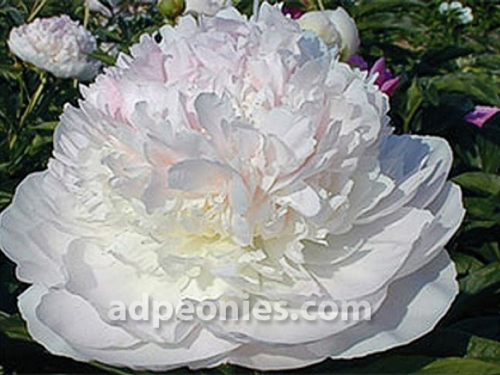 (Klehm before 1976) Broad creamy guard petals surround a large mass of wavy, pale yellow staminodes, then from the center an emergence of creamy white petals crown this striking white and gold peony; side buds give it a long bloom period. (Van der Balk/ Van der Swet 1953) Large double bomb with lots of side buds that extend the bloom; the flowers appear as double most of the time, but they also be may be semi-double of Japanese form with red stigmas; dense silky and shiny foliage; height to 37 inches so have some support on hand; admirable in the garden and a good choice for cut flowers.